Binghamton was recently named one of the top 20 college towns in the U.S. by both The American Institute for Economic Research and Business Insider. Here are some reasons why Binghamton is becoming a prime location for college students. Think you know everything there is to know about Binghamton University? Take this quiz and see how much of a Bearcat you really are! They say it takes a village to raise a child. Well, it takes the support of thousands to run a campus. Thanks to the continued dedication of alumni, students, faculty, staff, community members and friends of the University, Binghamton can continue to flourish. Tag Day is a campus-wide event held each year to celebrate those donors and their contributions. 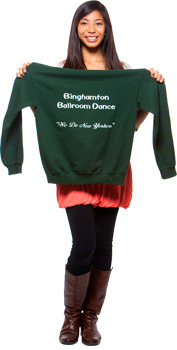 Here are just some of the things that wouldn't exist at Binghamton without donor support. Have you heard?! Binghamton University is ranked as New York's top four-year public college by American City Business Journal (ACBJ). U.S. News even ranks us as one of their top 50 public universities. And to top it all off, the Wall Street Journal recently ranked us as one of the best public universities for returns on investment. This made us wonder, what makes Binghamton University so great? We decided to ask students why they chose Binghamton.